When it first arrived on the building materials market nearly 30 years ago, oriented strandboard (OSB) was hailed as a wonder building material. But many OSB producers in recent years have discovered this is not a market for the faint of heart, given its dependence on the American housing market, which has essentially tanked in the last few years. Commodity grade OSB was developed as an engineered alternative to plywood. Its primary use is for sheathing in residential construction. However, OSB plants are now poised to morph into entirely new profit centres while reducing their dependence on home construction. For the first time in North America, an existing OSB plant, Tolko Meadow Lake OSB in Saskatchewan, has demonstrated the ability to quickly convert its production line from manufacturing commodity grade OSB to other engineered wood products such as laminated strand lumber (LSL). This gives the operation the capability of producing a family of strand-based panel products from a single line. Completion of this project is just phase one. The second phase currently being contemplated by Tolko will investigate better ways to optimize fibre geometry, to pursue higher performance products and more efficient use of fibre. Tolko is already harvesting the fruits of its labors by delivering new products to the market as a result of the plant modifications. On June 1, it launched a new T-Grade, re-engineered OSB flooring product for the residential market, its first product introduction since it adopted the new manufacturing processes and technology at the Meadow Lake plant. T-Grade OSB flooring is being marketed as having an 11.8 per cent increase in internal bond strength, 25.1 per cent increase in panel strength, 17.3 per cent increase in panel stiffness, and 18.3 per cent increase in moisture durability. The bottom line is that it is a more moisture resistant, stronger, more stable product. The success achieved at Tolko Meadow Lake will likely lead the way forward for the entire industry. While some existing plants are already focused on producing specialty strand-based products, the ability to economically manufacture a variety of products from one forming line has been industry’s goal for decades. Based on the results from Meadow Lake, it appears that this operation has finally achieved the breakthrough. Typically, OSB strands are layered in a parallel, perpendicular, parallel pattern on the forming line. 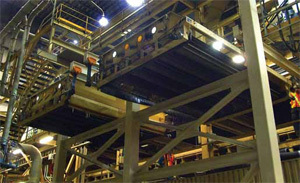 The Meadow Lake plant has developed the capability to layer the strands in parallel in all layers with minimal turnaround time to switch from one product to another. This breakthrough is good news for the industry, forestry-dependent communities, employees, and for the Canadian economy. OSB producers can now be more flexible, because OSB plants will have the ability to pursue a variety of markets from one production line and use that as a hedge to withstand severe downturns in the North American housing market. 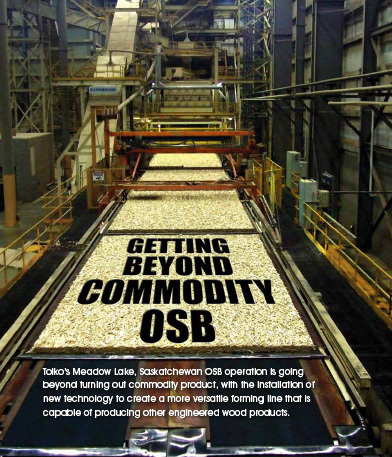 For the first time in North America, an existing OSB plant, Tolko Meadow Lake OSB in Saskatchewan, has demonstrated the ability to quickly convert its production line from manufacturing commodity grade OSB to other engineered wood products such as laminated strand lumber. The low investment cost of only $3.2 million to install and commercially demonstrate the new technology was shared by Tolko Industries and both the Saskatchewan and federal governments. This is a small fraction of the $200 million or more cost to build a brand new OSB plant. The technology was proven largely through research conducted by FPInnovations, another noteworthy achievement. 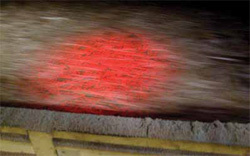 The new technology involves the use of an imaging system developed by FPInnovations to reduce and better manage a problematic material generated from the wood fibre stranding process called fines, achieve more efficient resin use, and implement forming line modifications that allow a plant to both adjust strand orientation and more accurately place fines material in a panel board. The result is higher quality commodity grade OSB products as well as the ability to expand upon a plant’s offering of strand-based products. Meadow Lake OSB has installed two of FPInnovations’ patent-pending FPFMS fines monitoring imaging systems at strategic locations on the production line to maximize its knowledge of how much fines material is being generated during the stranding process. Because fines content and their placement in the panel board has such a significant impact on the strength and characteristics of the final product, their management is critical in manufacturing higher quality commodity OSB and higher value added strand-based products. The plant is trying to minimize fines clumping and layering. The mechanical changes on the forming line itself include the addition of two parallel formers and, according to Snyder, developing the ability to manipulate pick roll speeds and pocket feeder speeds. This is accomplished partially through the use of variable drives. In addition to Tolko technical team leaders Kevin Blau and Tim Williams, Arden Engen from Greenwood Engineering, Troy Bessey from PCTM and Dave’s Electric helped design and install the plant’s new control systems. The project is the culmination of a great deal of work between FPInnovations and Tolko. New markets that may open up for OSB products include the improved, value-added products as demonstrated by Tolko’s new T-Grade flooring product, footers and headers in building construction, cross-laminated timber (CLT) products, and furniture components. The ability to manufacture new products also potentially opens the door to new markets outside of North America. The success of the Meadow Lake transformation opens entirely new markets for OSB producers. Up until now, companies have had to turn away business because they simply did not have the versatility within commodity OSB plants to switch to manufacturing specialty OSB products to meet specific customer needs. As part of the Meadow Lake project installation and demonstration, plant workers also showed that they could make the necessary changes to the forming line to switch from commodity OSB production to LSL production in under an hour. Tolko’s plant in Meadow Lake is the only OSB plant the company has still operating, after the devastating collapse of the American housing market. Reacting to poor market demand, the company shuttered plants in High Prairie and Slave Lake, Alberta. But Tolko wasn’t the only company affected by the collapsed OSB market. All other major Canadian OSB players, including Ainsworth, Grant Forest Products, Louisiana-Pacific, Weyerhaeuser and Canfor, have also experienced plant closures or curtailments as a result of the collapse, demonstrating just how overly dependent OSB producers are to a single market. The consequences of job loss due to plant closure or curtailment since 2008 have been felt in many forestry-dependent communities across Canada. 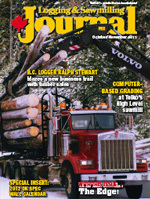 Also, major assets of Grant Forest Products were recently bought by Georgia-Pacific. Knudson says the success of the Meadow Lake transformation opens entirely new markets for OSB producers. Up until now, he says, companies have had to turn away business because they simply did not have the versatility within commodity OSB plants to switch to manufacturing specialty OSB products to meet specific customer needs. He adds that the breakthrough at Meadow Lake also opens up an entirely new area of research because OSB producers can now investigate and develop new products based on their newly developed ability to switch from one type of strand-based engineered wood product to another in a single plant. He estimates that it would take existing plants about six to twelve months to achieve the same transformation as Tolko was able to achieve in Meadow Lake, noting that the changes in Meadow Lake occurred while the plant continued to produce OSB. Knudson credits the outstanding team gathered in Meadow Lake who managed to complete the installation over about a three month timeline because of an imminent federal funding deadline. While there has long been a desire by industry to apply the knowledge accumulated over the past three decades to potentially transform commodity OSB plants to plants with greater potential for product diversity, it took the effort of this team to make it a reality.